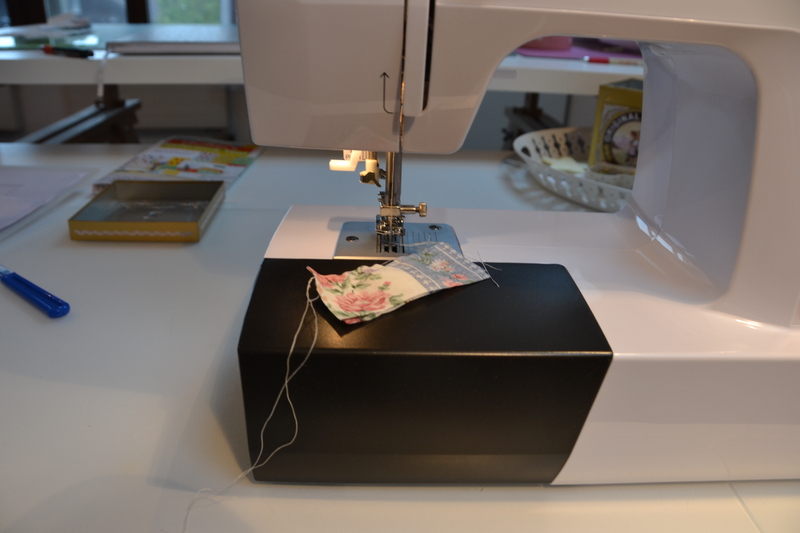 When I started to learn to sew, over three years ago, I had never touched a sewing machine. I had hardly picked up a needle to sew either, aside from some emergency repairs under my mother’s watchful eye. So when I started to look for a new sewing machine in 2012, I did a lot of research. Logically, though, when you don’t know much about sewing to begin with, it is difficult to know what you want out of a machine. I learnt that when buying a machine, it is necessary to examine what functions you need the sewing machine to be able to do. 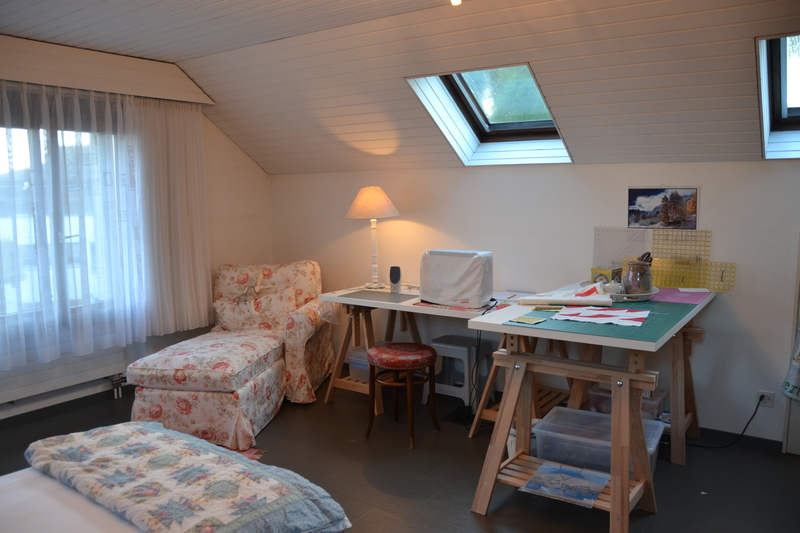 Before my trip to Amsterdam in 2012, I actually had no desire to learn to quilt. I wanted to be able to make home decor items and seasonal decorations. 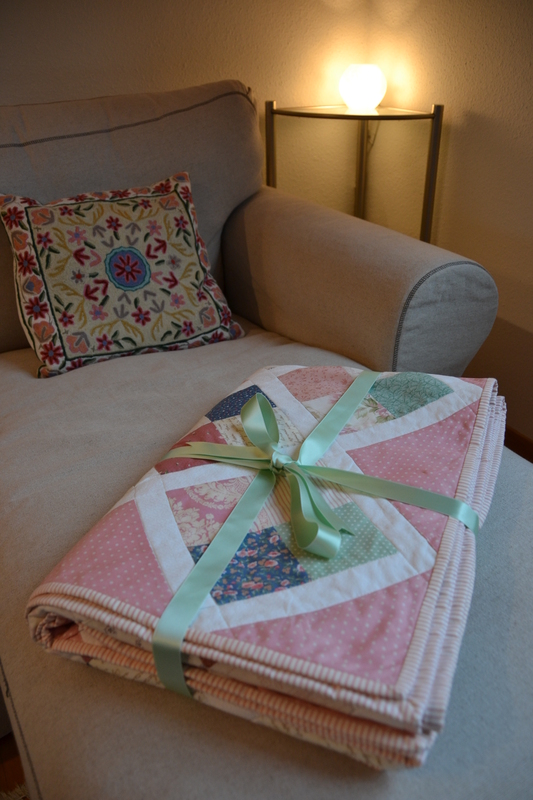 I had no plan to be a quilter. 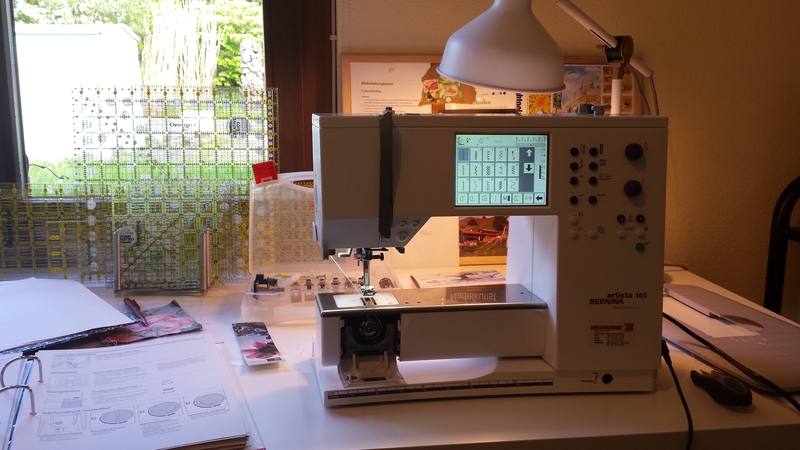 So that person that I might have become if I hadn’t visited Amsterdam and seen those lovely quilt shops, may have been perfectly content with the Bernina Bernette 15 that I own now. But I am not that person anymore . Now, I am a quilter. When I bought my machine, it wasn’t important if my machine was a ‘good’ or even ‘the best’ machine for quilting. I didn’t know if I was going to be a machine quilter or a hand quilter, and thus only needed the machine to piece, because I didn’t know if I was going to enjoy it. And with my long history with dabbling in different crafts, I, quite honestly didn’t think I would stick with it. But I knew that I do not believe in buying cheap products that are non disposable and are irreparable at the slightest malfunction. I learnt, that it was best to buy from a dealer and as the nearest in St. Gallen was a Bernina dealership I decided to look for a Bernina. I live in Switzerland, and I knew that even if I moved, I would always find a Bernina dealership near me, because they are everywhere here! Now three years later, I want to finally learn to machine quilt with ease and to free motion quilt. I want a machine that talks to me and tells me what on earth is wrong with it, or at least doesn’t give me sooooo many problems. I want a machine that allows me to ‘whip up’ a quilt in a weekend, not that I would necessarily do that, but, a month would be nice! And to machine quilt, something other than a simple straight stitch, I need another machine. Don’t get me wrong the Bernette (15) is a sturdy machine and it is backed by the Bernina name. But it is not a true Bernina as it is not made in Switzerland with the quality materials of the rest of Bernina and the quality of workmanship the Bernina brand is known for. If you have been following my quilty pursuits lately, you may be aware that I have been fighting with my machine to stitch together flannel material for a quilt. It has been a very slow process, well as soon as I started with half-square triangles that is. Like my previous quilt, I have a huge problem with the machine eating fabric. Now that is very possibly my fault and my lack of knowledge, but I have tried a lot of tricks both with my sewing itself and the machine. Now, I am sewing with my walking foot, maybe this is normal, I don’t know for multi-pieced quilt blocks. But, I thought the walking foot was only for when you have your quilt sandwich together, not sewing the block together! In any case it works OK, but my walking foot hops all over the place and so trying to keep things straight requires a lot of concentration, let alone trying to get a straight 1/4 inch line. 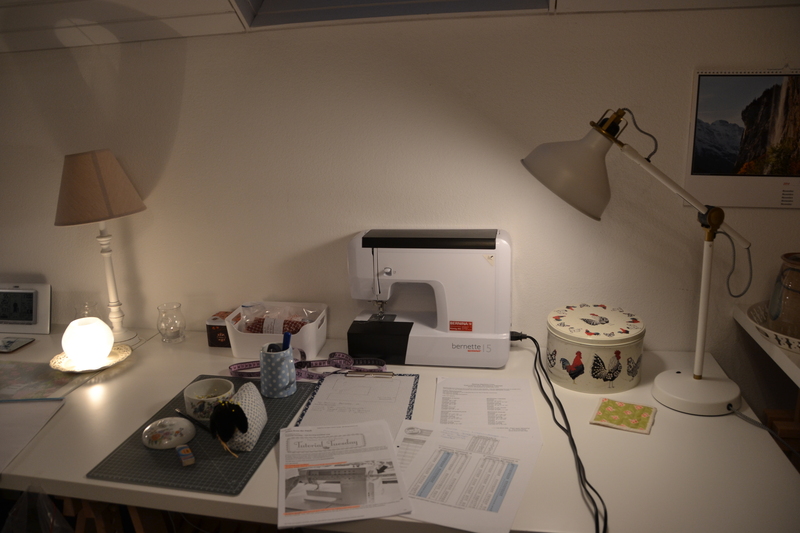 A few weeks ago, a friend who needed to borrow my Nikon for a course, offered to at the same time lend me her Bernina. I didn’t really know her as a sewer, so I just ignored the offer. But when I was complaining about my machine and she offered me to lend me her machine, I thought well, what could it hurt. It had to be better than mine. Afterwards she told me that it was a good machine, a computerized one, but I had know idea that it was such a good one and no idea that it was one for quilters too. a) How messed up mine is. The ‘Is it me or the machine?’ question. b) How much do I need/want a fancy, computerized machine? c) Do I want to purchase another expensive Bernina or would a brand like Babylock or Juki be more suitable for my needs. d) Do I want to to give up machine piecing and quilting all together. Stay tuned on the results of this …. age old frustrated quilter’s question. Hope you found this post interesting, useful or maybe just amusing at another quilter’s inadequacy! Oh don’t worry I won’t Meredithe!! So funny, no I have tried all that, and it generally works, but this last quilt, is flannel. It is all flannel. The top. It is too thick I think for piecing a schoolhouse block for example. But surely that is still not normal. Or maybe I need to change my needle. Just remembered that, never thought of the needle, it kind of goes unnoticed. What do you think with the flannel? PS Your studio looks so inviting! 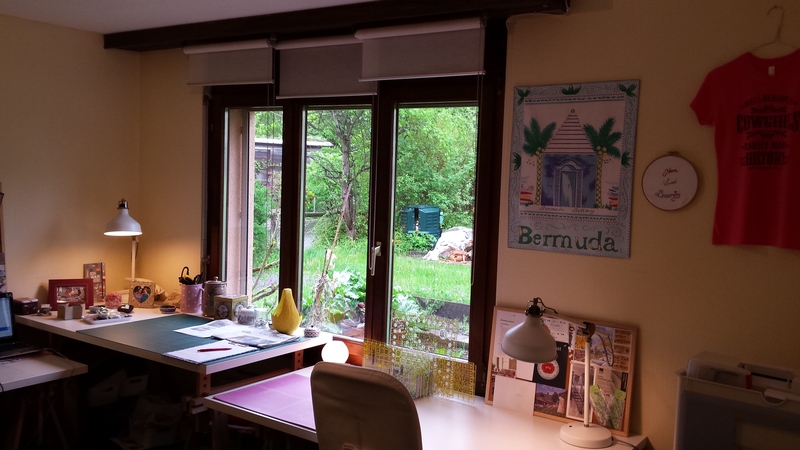 The new studio is my favorite place in the house, it is small, needs professional lighting recommendations for the winter and fall months where it will be a very dark room. But it looks right out into the garden. And when my pond works, I can watch the waterfall! When! Right now it feels like you are in the garden, being in there. How pretty is your studio??? Like you, I didn’t want to spend thousands on my first machine, and now I really wish I had. I’m sending lots of new machine vibes to the husband in the hopes Santa will be kind and leave a new machine under the tree for me! Thank you Rachel. Yes I think I am going to need to be creative in how I am going to get my hands on a better one. Yes, sewing machines, now I have narrowed it down to Bernina verses Pfaff, but after reading a great article on someones blog yesterday, I have decided it will be a while before I can make my mind up. I have also thought about a Singer, anything is possible right now. I want a sturdy machine and one for quilting in particular by machine. I see from one of your quilts you too have a Canadienne Fan in your life. Or was that, oh I see, a brother. My husband would love it. He is a big fan. I love Jeans and quilts, maybe one day I will put that project on my list, they must be very durable. From what I read, a job for a Juki, a sturdy, Japanese, historically Industial sewing machine. Oh what one learns when one does just a tad bit of research. I think us quilters could talk hours simply about their machines.